Dimensions 0.80 by 5.19 by 7.76 in. Amazon.com description: Product Description: A brilliant and visionary argument for America's role as an enforcer of peace and order throughout the world--and what is likely to happen if we withdraw and focus our attention inward. Recent years have brought deeply disturbing developments around the globe. American sentiment seems to be leaning increasingly toward withdrawal in the face of such disarray. 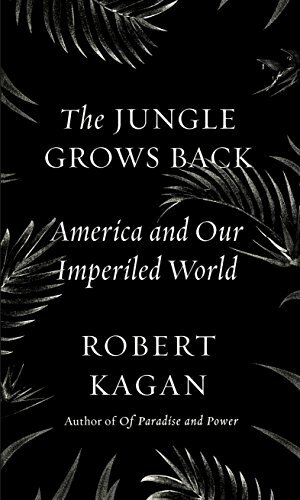 In this powerful, urgent essay, Robert Kagan elucidates the reasons why American withdrawal would be the worst possible response, based as it is on a fundamental and dangerous misreading of the world. Like a jungle that keeps growing back after being cut down, the world has always been full of dangerous actors who, left unchecked, possess the desire and ability to make things worse. Kagan makes clear how the "realist" impulse to recognize our limitations and focus on our failures misunderstands the essential role America has played for decades in keeping the world's worst instability in check. A true realism, he argues, is based on the understanding that the historical norm has always been toward chaos--that the jungle will grow back, if we let it.